Have you ever thought that the organization is on life support and everyone is rushing towards it with more band-aids and medicine, but the bleeding continues? It’s not a very appealing image. And yet, it is our reality since we are still stuck in the 20th century when it comes to managing organizations and our leadership practices. Close your eyes for a minute. When you open them you are watching a patient on a gurney in the ER of your local hospital. This patient is on life support and the doctors are standing on the side mumbling about their mysterious disease. They call in the experts. One suggests that the patient needs some social business strategy; that would surely revive the patient and the more followers it gets, the better. Another suggests a re-organization as maybe the parts are in the wrong configuration; that would surely be the answer and stop the bleeding. If we just throw $50 million at the problem, we would fix it with a brand new liver. A third expert flies in from a far land and recommends a new branding campaign; that would positively help reposition the patient. With just a little more amplification of the messages, the patient would heal in no time. And finally the fourth world-renowned expert says that this cool new technology would solve all the woes not only for the patient but also for the world with its revolutionary capabilities. And yet, the patient continues to bleed. When a band-aid is placed on one wound, another one opens up. Why? It’s simple. We’ve lost business common sense. We are living in a world that is seeking short-term solutions instead of doing the hard work. We need more systems-thinking approaches that start at the head and not the tail. 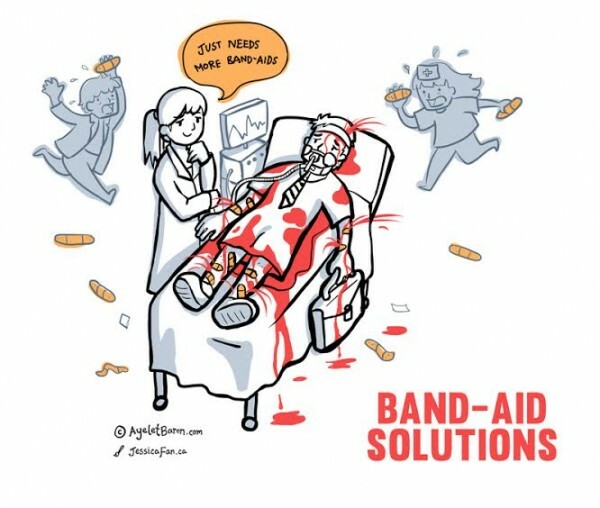 Identify the band-aid solutions in place. Put the smelly fish on the table, or as we like to say in Canada, put the Moose on the table, and really acknowledge and address the problem. And then ask: what happens if we solve it? What is the opportunity? Does the patient get one more year to live or has the patient been able to not only heal itself but also create a new life? What is abundant in our world that creates new markets, products and/or services? Understand your own culture. Listen to people. Go have conversations (not meetings). Ask questions and listen. Find business partners who can help you analyze what you are hearing. Uncover the uniqueness of what is in the hearts and minds of people beyond the PowerPoint slogans. Assess the gap between what leaders are saying (words) and what they are doing (actions). Also understand what would motivate people to help the patient heal holistically. Don’t waste your time with best practices and someone else’s diagnosis. Please don’t go to the latest and greatest hyped solution on the market as your people will call it the “flavor of the month.” Find leaders who have gone through similar problems who may be outside of your business sphere and connect with them for conversations. Look for thought leaders who solved similar problems in practice not theory. Listen and learn about what worked and what didn’t for them. Remember your culture and prototype with the right people. Never do another re-organization (please). Go back to the drawing board and evaluate your mission, vision and strategic frameworks and ask yourself what’s our purpose? Invest the time in simplifying and leading with purpose. Shuffling the deck chairs on the titanic usually brings the same results – over and over. A re-org is simply a bandaid solution so take the time to identify and address the systemic problem. If your strategy is simply to build an organization based on “butts in seats” without the vision and purpose, prepare to fail. I see this story happen in so many organizations when leaders explain why they decided to change by talking about the organization chart before bringing people toward the vision and purpose. Create shared purpose. Forget the different departments and functions. Be very clear about what you will achieve together across the whole body of the organization and make sure the right organs are functioning together in harmony. Once you are clear, then and only then, figure out the people, technology and process you need to enable that purpose through a connected network with trusted internal and external communities. What’s your shared purpose? What will make people jump out of bed every morning excited about achieving it? How do you tap into the hearts and minds of your killer app for the 21st century: people?